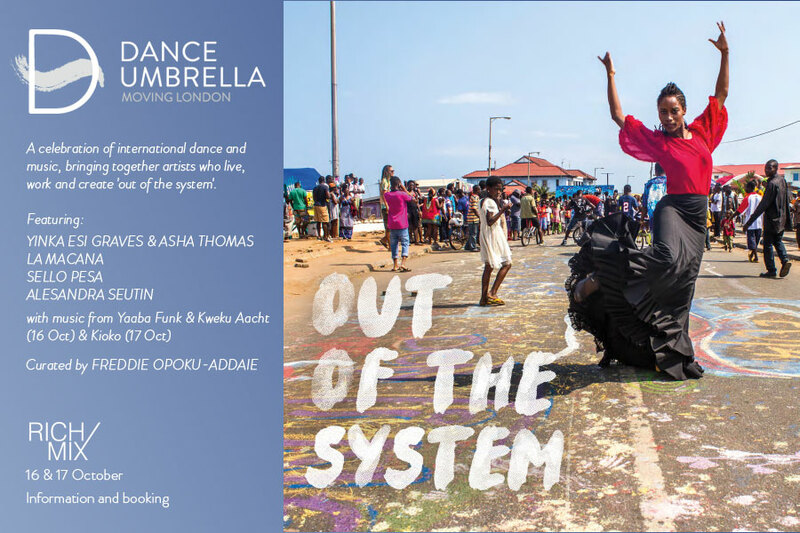 Out of the System (curated by Freddie Opoku-Addaie) is the first in a new series of programmes for Dance Umbrella, London’s annual festival of international dance. Yinka Esi Graves and Asha Thomas open the evening with Clay, exploring the connections between ‘who they believe themselves to be, and the unconscious parts that make up who they are’. The movement language (and live accompaniment by Guillermo Guillen) blends Flamenco to Contemporary to African. Graves and Thomas pound their heels into the floor at lightning speed whilst maintaining a sense of ephebism, responding to the complex rhythms their bodies are compelled to make. 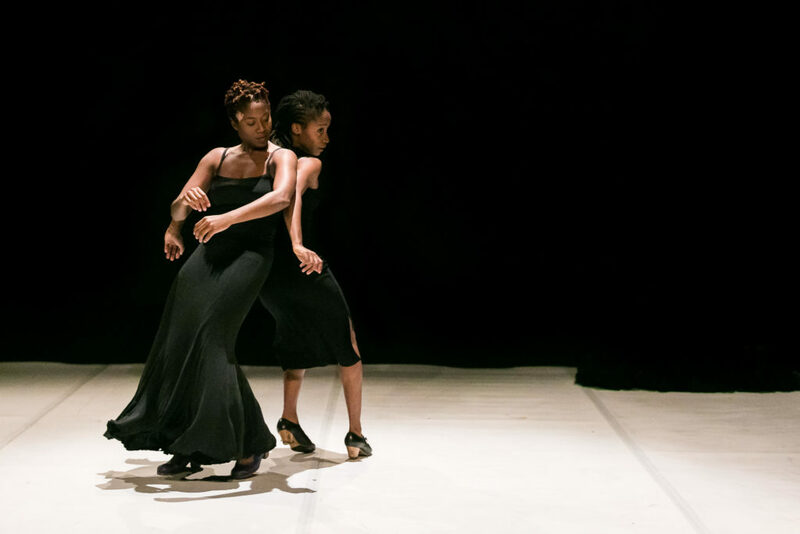 Later, the dancers each have solo moments, using props and additional costume that seem disjointed from the rest of the work – detracting from their technical skill and slowing the pace. Clay is strongest when the two are dancing together, sharing their cultures and histories as an exchange in movement. Clay, Yinka Esi Graves and Asha Thomas. Photo by Luis Montero. Continuing the exploration of identity, Alesandra Seutin performs a self-choreographed solo Across the Souvenir. Seutin enters the space from behind the audience. Following a pathway of light around the stage, she walks slowly, regal, wearing a white mask that partially covers her face and a long white skirt that carries movement with each step. Projection is used throughout the work, stopping the action on stage and disrupting the energy. We see women washing away a white line on a black wall, a close up of white shoes walking slowly… Seutin pulls a row of white shoes out from underneath a white bench, all connected by white strings, and begins to dance on the pathway these present to her. Her energy comes from the ground up, causing her spine to convulse and travel in waves as she is pulled along the strings. Perhaps the shoes, or identity, she has been presented with, don’t quite fit, and her body is making sense of this contradiction. Black female spirituality is being examined here, and Seutin gives a moving performance. The final piece of the night is VEN a duet by LA MACANA designed specifically for street festivals, performed at Rich Mix with audience on three sides. Caterina Varela and Alexis Fernandes are exceptional. The first half of the piece is spent with Varela launching herself at Fernandes, who catches her in his arms, on his shoulders, around his neck, across his thighs, behind his back – as if they are playing a game against physics. Later, the roles are reversed – Fernandes never touches the floor. His hands, feet, and any other part of his body only ever come into contact with Varela. 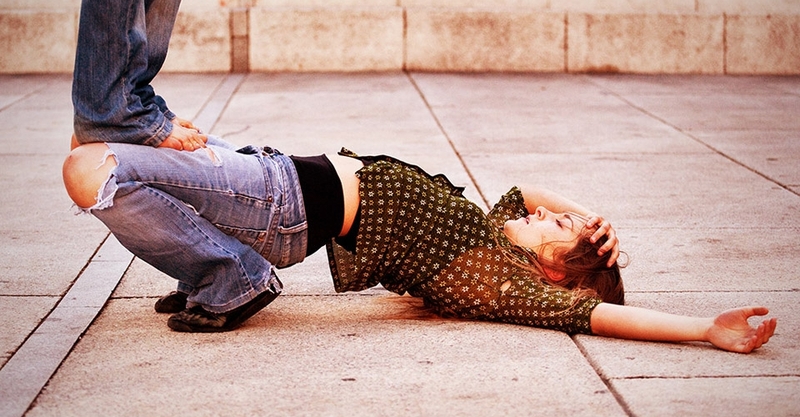 A particular highlight is when Varela is lying on the floor on her stomach, Fernandes is standing on her buttocks, he jumps high into the air tucking his knees into his chest as she rolls once to arrive back on her front, and he lands back where he started. There is tenderness to the duet, but also a sense of rigour – testing what each other can do as opposed to being driven by emotion. I spent the entire piece wondering with excitement what they were going to do next – VEN is an exhilarating watch. Out of the System is an ambitious programme that gives opportunity to worthy artists who may not usually be invited to present work in Dance Umbrella. Congratulations to Opoku-Addaie for curating an excellent evening, I hope this is a model that will be taken forward in future years. *This review was also written for Underdog Reviews, which I now contribute to. You can find it on their website here, along with interviews, behind the scenes articles, and reviews from across the UK.